One day a fisherman was lying on a beautiful beach, with his fishing pole propped up in the sand and his solitary line cast out into the sparkling blue surf. He was enjoying the warmth of the afternoon sun and the prospect of catching a fish. About that time, a businessman came walking down the beach, trying to relieve some of the stress of his workday. He noticed the fisherman sitting on the beach and decided to find out why this fisherman was fishing instead of working harder to make a living for himself and his family. "You aren't going to catch many fish that way," said the businessman to the fisherman, "you should be working rather than lying on the beach!" The fisherman looked up at the businessman, smiled and replied, "And what will my reward be?" "Well, you can get bigger nets and catch more fish!" was the businessman's answer. The businessman replied, "You will make money and you'll be able to buy a boat, which will then result in larger catches of fish!" "And then what will my reward be?" asked the fisherman again. The businessman was beginning to get a little irritated with the fisherman's questions. "You can buy a bigger boat, and hire some people to work for you!" he said. The businessman was getting angry. 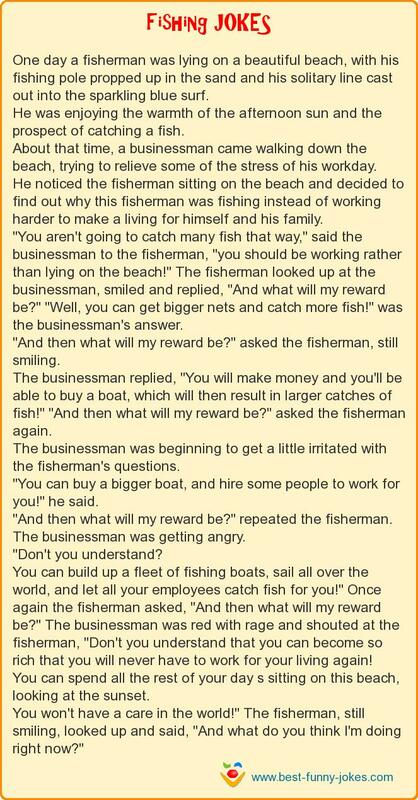 You can build up a fleet of fishing boats, sail all over the world, and let all your employees catch fish for you!" Once again the fisherman asked, "And then what will my reward be?" The businessman was red with rage and shouted at the fisherman, "Don't you understand that you can become so rich that you will never have to work for your living again! You can spend all the rest of your day s sitting on this beach, looking at the sunset. You won't have a care in the world!" The fisherman, still smiling, looked up and said, "And what do you think I'm doing right now?"